Pranks are usually done at someone else’s expense, and they seem easily to slide into mean-spiritedness. But the prank played on waitress Chelsea Roff ended up … a little differently. Maybe you can’t afford to give someone a car right now, or a trip to Hawaii, or a thousand-dollar tip. (Join the club!) But you can give some encouragement, you can share some home-baked deliciousness, you can help that older neighbor with lawn chores–or at least pay them a visit. God has given us so much. He has been lavish in His creation and in His gifts of light and life, love and laughter. Yes, there is sadness and tragedy in the world–too much of it. But that is precisely why we are called to show God’s love. His love isn’t a gushy feeling; it’s shown through actions that seek to help, to comfort, to care. Is there someone you can surprise–in a good way–today? Is there a way you can prank someone into having a better day, or a better week? Is there a way to use the day to share God’s love? Have at it! The broken end table peered at me from its place in the corner, leaning drunkenly to the side. We couldn’t put anything on it, and it certainly wasn’t fit to display; a broken leg made sure of that. It wasn’t even ours to begin with. “Why don’t they just get rid of it?” I asked. Really, I was wondering why we couldn’t just get rid of it. We were waiting for the perfect match of stain, or a certain piece of hardware; I no longer remember which. But I do remember wanting it to be gone. One of the things he loved was Christmas. We made cards and crafts together. We baked cookies. He liked to wrap gifts. They didn’t always look terribly polished, but they definitely looked like they were wrapped with love. And he loved the Nativity story. We read it from several different versions and books, and sometimes he “read” it to his stuffed animals or the cat. It was important to us that our children not see God as far away and unreachable; one expression of this was that we had a sturdy Nativity set, one that could withstand little hands. 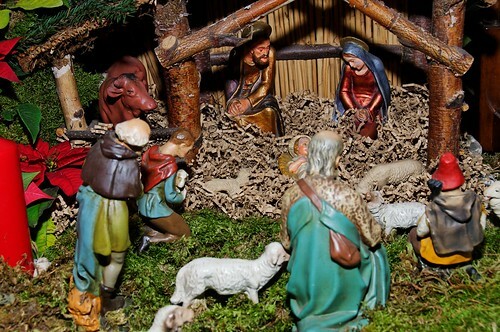 As the Christmas season wore on that year, more and more animals made an appearance at our manger. There were the cows and sheep, horses and goats from his farm set.